Sweden were in Euro 2008 and the media and marketing activity around the tournament showed what we missed as a result of England not qualifying. These are just figures on paper though. I have just spent the last 2 weeks in Sweden and seeing how much excitement there was around Euro 2008 makes me realise how flat it was in the UK. England not qualifying meant there were no England songs in the UK charts. Traditionally there are a plethora of tournament related musical offerings, but this time there was little public interest in a re-release of Three Lions etc. Sweden has served as a reminder of what we have been missing as the Swedish top 10 has been dominated by Euro 2008.
and the singles chart has had various football related entries from Swedish acts like Markoolio and Frans feat Elias. There has also been a return for Rednex (the group behind 'Cotton Eye Joe'). Rednex got to number one in Sweden with a song called 'Football is our religion.' The video is below - enjoy! 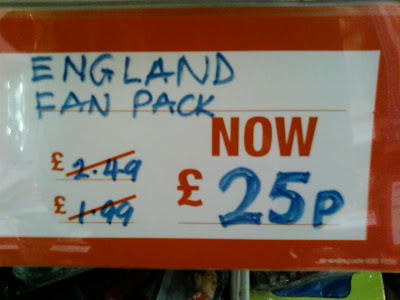 During a major football tournament we are used to seeing the faces of English players like David Beckham and Michael Owen appearing in everything from ads for ASDA through to sports equipment and products like Pepsi - but with England not qualifying there were few (if any) topical football ads. Player endorsement was evident in Sweden over Euro 2008, however whilst Swedish media coverage of the Sweden team focussed on Zlatan Ibrahimovic, there is no doubt who the Swedish advertising poster boy is. 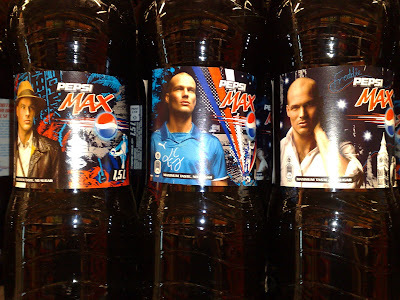 Freddie Ljungberg has been on a wide range of products including using a variety of poses on Pepsi Max bottles as well as appearing on random cardboard cut outs. 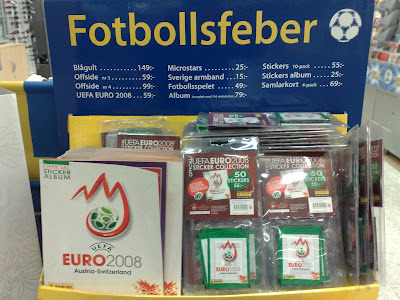 A number of Swedish products piggybacked Euro 2008 with their advertising and packaging. I was particularly impressed with Norrlands Guld lager. Norrlands Guld is literally translated as North Lands Gold. 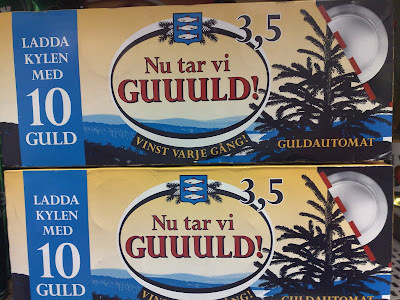 Originating from the North of Sweden, through various tongue in cheek, Swedish themed advertising Norrlands Guld has become one of the most popular beers in Sweden. For Euro 2008 packaging was changed and an ad campaign was created around the theme of 'Nu Vi Tar Guuuld!' (now we take gold). TV4 also produced a discussion programme called 'EM Magasinet' after every match. Broadcast from an outdoor location every night in Stockholm, in my eyes it compared favourably to the UK coverage. A modern and stylish set plus a rotating panel of guests including ex-Man City Assistant Manager Hans Backe, current Swedish players like Rami Shaaban and Swedish legends like Martin Dahlin kept the programme fresh and different every night. TV4 also had female discussion participants like Anna Brolin - a massive (and refreshing) change to the English diet of regulars like Hansen and Alan Shearer! I enjoyed watching the tournament in Sweden and it was great to be in a place where Euro 2008 was front page news every day, rather than in the UK where the semi-final reports only managed to make pages 8 and 9 of the Daily Telegraph sport section. And whilst much of the Swedish Euro 2008 marketing was generally as expected, but there were some interesting new ideas. 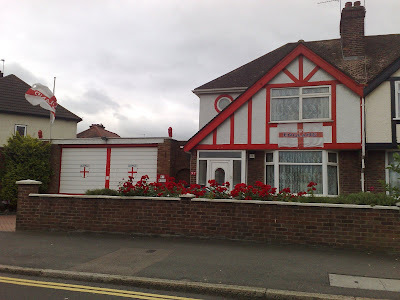 I thought Euro 2008 was a great tournament and I enjoyed watching it in Sweden, but I hope Fabio Capello can now sort things out and make sure England qualify for the World Cup - though after seeing this house in Hayes yesterday I guess for some people it doesn't matter whether England qualify or not!